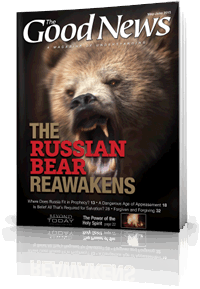 In this issue, read a personal perspective about what's going on in Russia and Ukraine and what your response should be in the light of Bible prophecy. In the "Exploring God's Word" section, learn more about the power of the Holy Spirit and how your life can be transformed by knowing your future destiny. Also, understand the conditions of God's gift of salvation and the gift of forgiveness. 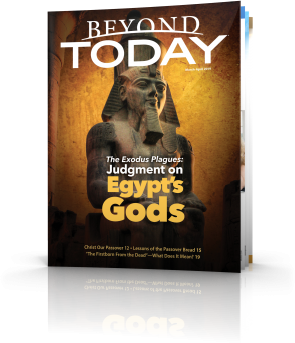 Download the PDF version of this issue of The Good News as you wait for the individual web articles to be posted in the upcoming days. Bruised by two long wars, America began a retreat. Not surprisingly, others rushed into the vacuum. Russia’s recent actions in Ukraine follow a long history of imperialist oppression. Are these events leading the world back to the brink of nuclear extinction? Russia often doesn’t make sense to the West. We should give attention to the ongoing crisis in Ukraine—what’s behind it, where it may lead and the terrible human toll being paid. Here is some needed perspective from one with personal ties to the region. Are We in a Dangerous Age of Appeasement? 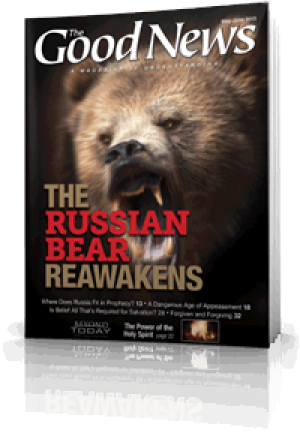 Two significant powers, Russia and Iran, are throwing their weight around and taking over nearby territory. But rather than stand up to them, Western powers—especially the United States—meekly acquiesce. The parallels with the pre–World War II appeasement of Adolf Hitler are striking. Is your life ruled by fear and uncertainty? Do you feel disconnected from God and unsure of how to improve your life? Learn how God’s Spirit can powerfully transform your life. For half a century after World War II the world was divided in two in terms of international power—split between the American-led free world and the Russian-led Soviet Union and Eastern Bloc. In early April 2015 a group of educators in Atlanta, Georgia, were found guilty in one of the largest cheating scandals in U.S. history. The state of Indiana recently passed the Religious Freedom Restoration Act (RFRA) to ensure that people operating businesses are not compelled to act against their religious convictions.